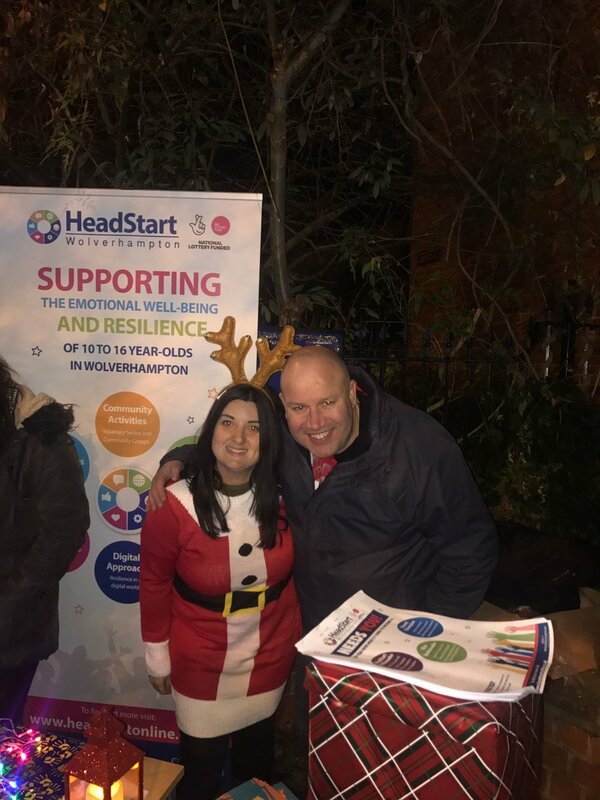 On Friday 1st December the HeadStart Bilston East team joined in the celebrations at the Christmas Light Switch On to launch the opening of their base at Bilston Town Hall. The team had a stall outside the Town Hall with lots of Christmas craft activities including making a HeadStart pledge and an advent calendar of hints for a healthy Christmas and New Year. 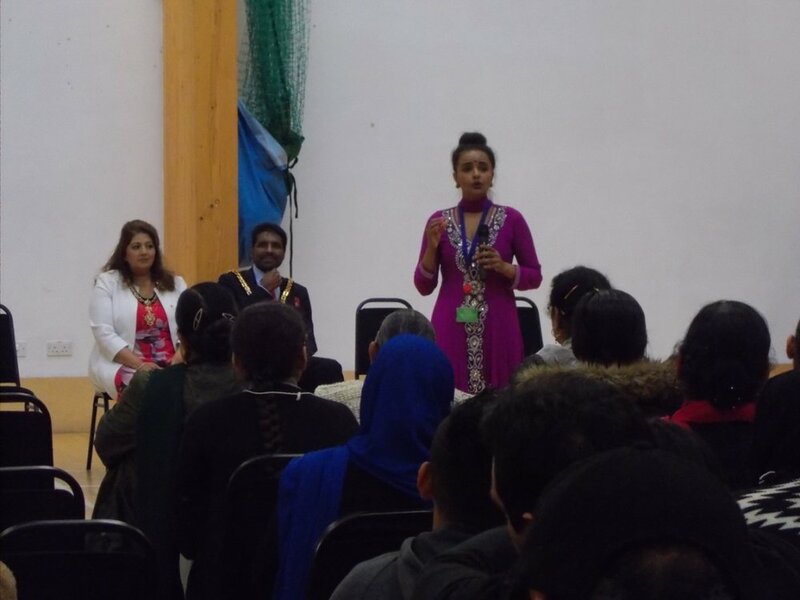 Staff promoted the forthcoming Mini Ambassadors and Parent Champion opportunities and recruited a number of young people to join HeadStart Bilston East’s events. The event was an excellent festive community celebration with VIPs including Doreen Tipton and the Deputy Mayor. HeadStart Bilston East is now operating from Bilston Town Hall. Nicola Holmes, Senior Community Development Coordinator said ‘It is so important that we have a physical presence in the heart of the community, and we look forward to launching our Mini Ambassadors and Parent Champion programme in the New Year”. Parents interested in getting involved with HeadStart can contact Nicola.Holmes@wolverhampton.gov.uk. With the cold weather upon us, the summer holidays and the HeadStart Summer Programme may seem a distant memory. This video from the Newshounds working with the Gazebo Theatre Company, however, really brings the HeadStart activities of the summer to life. Take a few minutes to watch, listen, enjoy, and feel the warmth of a great summer of activities! Last Wednesday, the Wolverhampton Safeguarding Board's B-Safe team and HeadStart Wolverhampton came together to organise a series of anti-bullying workshops at the Molineux, with primary age children attending in the morning and secondary students in the afternoon. Every young person participated in a series of workshops lead by organisations including Central Youth Theatre, Action Work, The Switch Project, West Midlands police, and the HeadStart team. Activities included discussion sessions, creative arts, role play and music. Steve Dodd, board member for the Young Person's Safeguarding Board for the City of Wolverhampton, had this to say "It's really important for events like this to show the young people the impact of bullying, and to gain their insights and opinions on how to best tackle bullying head on." The day was a huge success, with students making posters, writing music, forming pledges and building their confidence in verbal and body language techniques for dealing with bullying situations. Sunita Pallan-Jhalli, the HeadStart Young Person Engagement Senior Coordinator said "It's so important to have events like this within our city. The B-Safe team have done very well over the years tackling this particular issue and I believe will continue to do so in the foreseeable future." A number of young members from the B-Safe team attended to help support the event, supporting the sessions and sharing their own personal experiences. One of them, Brandon Leadbetter had this to say "I feel like I can inspire other young people to take action in my city, events like this allow use to have a real impact on all generations"
An audio snippet from the workshops - what matters to young people? HeadStart Community Bases in Low Hill and Blakenhall are a go! The first two new HeadStart Wolverhampton community bases have been officially opened. A total of four bases are being established, one in each of the key HeadStart Wolverhampton target areas. Each base will be home to a multi-agency team comprising a HeadStart Community Development Co-ordinator, a Young Persons Engagement Co-ordinator, a School Support Co-ordinator, a Child and Adolescent Mental Health Services (CAMHS) link worker and Police Community Support Officer. The team will also conduct outreach work in schools and the local community. The first base at Low Hill Library on Showell Circus held its launch event on Friday 1st September, and will support the Low Hill, Scotlands and Bushbury South area. The second, at the Bob Jones Community Hub on Bromley Street, held its launch event on Friday 9th September, and will support the Blakenhall, All Saints, Parkfields and Ettingshall area. Further community bases are also being established in the other two key HeadStart Wolverhampton areas in Heath Town, Park Village, Eastfield, Springfield and Old Heath; and Bilston East. During the launch event, HeadStart staff introduced the young people and members of the community who attended to the work that HeadStart will be leading over the coming months and years. The highlight of the launch event were a set of performances developed by the young people as part of the Summer Programme in Low Hill, Scotlands and Bushbury South, where they had worked with Revolution Dance and RML Rock School. All the young people that performed had no previous experience with performing on stage, but delivered a magnificent range of performances to the community and family members. The performances included choreographed dance routines, and a HeadStart song, written specially by the young people. The opening event was a great success - many thanks to all of the young people, families and members of the community who attended, and, of course, to the amazing young people who performed at the event. The Mayor of Wolverhampton, Councillor Elias Mattu officially launched the HeadStart base for Blakenhall, All Saints, Parkfields & Ettingshall at the Bob Jones Community Hub on Saturday the 9th September. Over 200 people, young and old, attended a fun packed Family Open Day organised by Positive Participation LTD and funded by HeadStart as part of the summer activities programme. 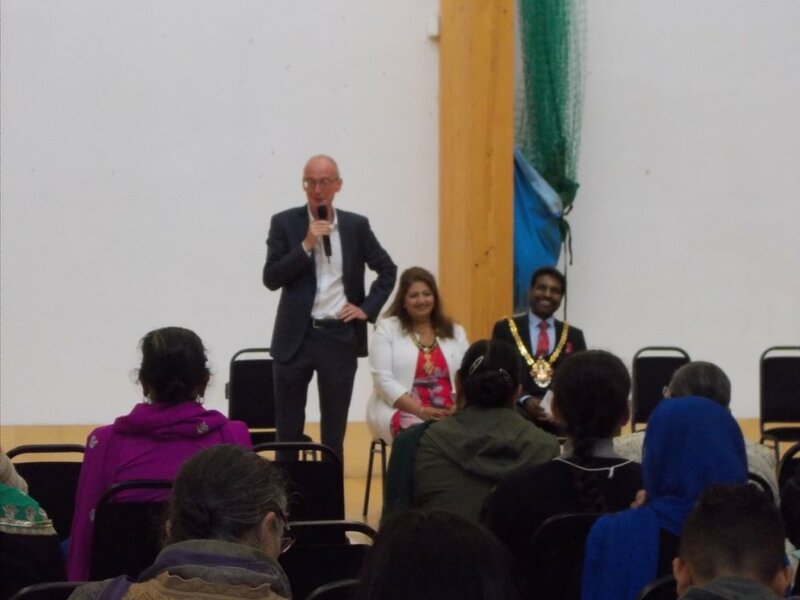 Also in attendance were Pat McFadden MP, the member of parliament for Wolverhampton South East and local Blakenhall Councillor Harbans Singh Bagri. Certificates were awarded to 25 young people participating in a work experience programme which involved planning the Family Open Day and helping out on the launch. Everybody enjoyed the performances and workshops which took place including Break Dancing, Henna Art and Bhangra! HeadStart staff were on hand to explain their roles and to answer questions about the work that will be taking place in local schools and community. The national mental health director for NHS England visited Wolverhampton to focus on mental health issues in the Black Country – and was "uplifted and excited" by the work of the City of Wolverhampton Council and its partners. Claire Murdoch met representatives from the council and a wide range of other organisations at the event at the Civic Centre earlier this month. Hosted by the council, it reflected on the good work taking place in the region to support people with mental health needs, and looked at areas for further development. Claire Murdoch, national mental health director for NHS England, and Linda Sanders, the City of Wolverhampton Council's Strategic Director People, with members of the HeadStart Wolverhampton team including Amelia Chalack, Sunita Pallan Jhalli, Tara Bourne, Megan Williams, Nicola Holmes, Jessica Sharp and Emma Sayles. Claire, who has been a registered mental health nurse for more than three decades, also met young members of the pioneering HeadStart Wolverhampton programme, which is helping 10 to 16-year-olds cope with life’s challenges. She said: "I was stimulated, humbled, uplifted and excited by all I heard about the work of the council and its partners. The passion, values and creativity shone through and I really had insight into the ideas and plans. I was blown away by Wolverhampton's youth – the future is bright." Linda Sanders, the City of Wolverhampton Council's Strategic Director People, said: "Everyone made a strong impact on Claire and I am sure she will utilise some of her findings in her national role and bear Wolverhampton in mind when opportunities arise to contribute further to the implementation of the national programme in the future. "The day underlined the importance of strong national policy direction with passionate leadership, and the impact of this on local implementation. It was great to hear how pleased Claire is with the way we have embraced the national programme here in the Black Country. "A key challenge highlighted by Claire was to change the somewhat negative narrative around mental health support and services, and that is something we are determined to do here in Wolverhampton. Our HeadStart programme in particular is a very positive scheme which is an inspiration to us all and which is set to have a huge impact on the lives of so many children and young people."